Reading food labels is one way to make us healthier eaters and smarter shoppers. But who has the time to digest all those details and the knowledge to understand what we’re reading? Plus, not all labels will tell us what we want to know. Will this meal trigger my food allergy? Does that one contain genetically modified organisms? 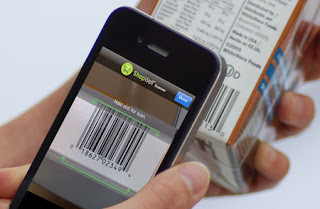 A new generation of smart phone apps uses a mobile phone’s scanning ability to drill deep into the contents of packaged foods to deliver more information, in plain language, about what’s really inside. 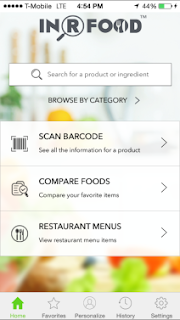 The apps work by scanning the bar code that’s printed on most grocery food and retrieving information from an online database of foods and their ingredients. Here’s an example. If you use ShopWell to scan the barcode on a package of Healthy Choice Chicken Basil Panini in the frozen food section, the app will tell you that the sandwich is a good source of iron, protein, fiber and calcium but it also has more sugar and sodium than you might want. ShopWell will also warn you if a packaged meal contains, nuts, shellfish, eggs, soy or other ingredients that might cause an allergic reaction. And it offers alternative choices for many foods such as a breakfast cereal that has less sugar than the in brands you see on television. InRFood also scans a barcodes to see what’s inside the package. Does that pizza contain artificial colors, trans fats, high fructose corn syrup, glutamates or GMOs? InRFood says its database contains more than 500,000 products including private label and international foods. Users can create a profile based their age, gender, weight, height and activity level. Then when they scan a package label, the app tells them if the food has more salt than they need and if it’s a good source of vitamins and antioxidants. Most food labels list calories, but how can you tell if they are the so-called “good calories” that come from protein, vegetables and fruit or the “bad calories” that we get from sugar or processed carbohydrates? Getting a true picture of calories is an important step for anyone trying to manage their diet in order to lose weight. And calorie quality is one of the focal points of Fooducate. When you scan a label with this app, you get a report card that rates the quality of the calories inside. If you set eating goals that include a calorie budget and tell it what you eat, Fooducate will track your progress with each meal. For people who have dietary restrictions, ContentChecked has developed a group of apps that help users guard against consuming too much sugar or eating foods that could cause an allergic reaction. 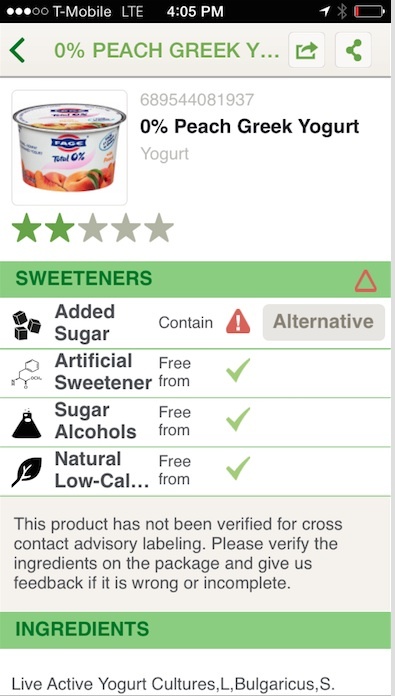 With one of the apps, SugerChecked, users scan a product to see if it fits into their personal sweetener preferences. 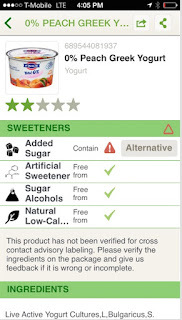 They can tell the app to warn them if a product contains added sugar, an artificial sweetener, natural sweeteners or sugar alcohols. Another app, MigraineChecked, takes a similar approach by identifying foods that contain ingredients that are known to trigger headaches in some people. The ContentChecked apps can be customized to fit the users personal dietary profile and they can also help those who prepare food for people who have sugar restrictions or food allergies. 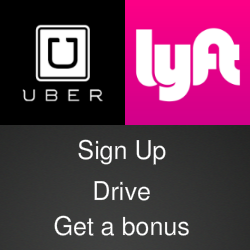 All of the apps listed here are free and most are available for both Apple and Android mobile devices.